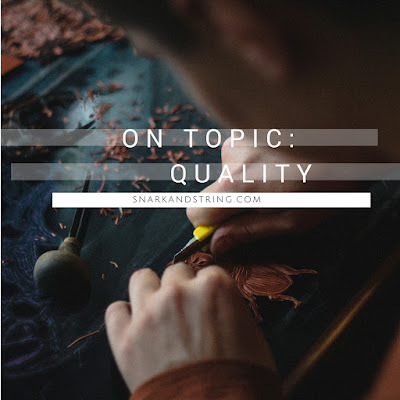 What does 'quality' actually mean? If we think about the general conception of quality our answers will probably lie some where in the range of product identification; the product works well doing whatever it does and will last a very long time. What about quality as an idea for the entire of life rather than just constrained to the objects and moments we experience. To live a quality life is not just an idea presented by Buddhist teachings or the Pinterest meme posted by 'that one friend' on your Facebook. It's not about having 'quality' things or even being a 'quality' person. A quality life comes from the mental and physical appreciation of greatness in all forms and in all moments, and the ability to recognize them. Imagine this scenario: Suddenly you find yourself without a means to carry around your money. Imagine it's literally a pile of cash and your bank cards that you have no pockets, no purse, and no billfold to carry, but you are right next door to a Dollar Store. You might think, "I'll just run in there real quick, buy a $10 wallet and then when I have more time and money to invest, I'll get a better one." Easy, right? The wallet is super cheap and functions just as you'd expect a wallet to function. Except for the fact that all day, every time you have to pay for something you have to pull out this wallet that was cheap and easy. The texture of it feels terrible, you begin to realize the construction of it is shoddy, and that it smells like melted plastic. You start to feel embarrassed, wonder if you smell like plastic, and then wonder if other people are noticing your cheap smelly wallet and thinking you're cheap and smelly. Part of you also is not looking forward to spending more money on another wallet, because you know that they can be expensive. You also have no time to figure out where the best place is to purchase a wallet that a) functions as it should b) is made well and c) is in your price range. You have to educate yourself on how to find and assess quality as it pertains to the factors individual to you: money and time. All of the stress in this scenario could have been avoided by picking up a .75 cent birthday card and using the envelope to hold your money. Something that people do all the time when getting money at a physical bank location. The scenario above is what our entire culture is set up for: the quick fix, the instant gratification of having solved a perceived problem or filled a 'happiness hole'. There are some people who would understand the wallet I described above as quality, and that's completely okay. There's a saying I heard awhile back "if you won't dust it, don't bring it into your house." The same is true for quality, if you aren't inclined to take care of something, don't invest in it - whether it's people, objects, or how you spend your time. When I talk this week about quality, it is not as a means to describe products, but rather a mindset. I will propose a different definition and ways of changing. Fair warning though, this is just as new to me as it is to you, so let's deprogram together. Arcadia Grenier is a long-time Wichita native and self described planner addict. Data analyst by day and artist by night, she enjoys teaching others how to find journaling and planning systems that promote inner balance and self expression.